KBE is a high end professional company and I am happy to say that the whole experience of renovating my kitchen was easy and without any complications. Thank you Anna-Maria for this review, it was a pleasure working with yourself and Michael. Thank you for letting us into your home, the end result is beautiful! Thank you for your review Stuart, really appreciate it! Thank you for your kind feedback. It was a pleasure working with you both. We hope you continue to enjoy your stunning new kitchen. Hi Jen, Thank you for your lovely review! We hope you are enjoying your new custom kitchen. From the KBE Team! Thank you for your lovely review Wendy! The photos look beautiful! From the KBE Team. Thank you Jan, We hope you are enjoying your new custom kitchen! Please let us know if you ever require anything. From the KBE Team. Great job. Very happy with the job and all trades. All on time. Would recommend your company to anyone interested. Thank you Alan, we hope you are enjoying your new custom kitchen! 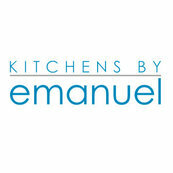 I am very satisfied with the Kitchen By Emanuel (KBE) and definitely recommend KBE for anyone who is going to do kitchen renovation. Thank you for your review Don, it was lovely working with yourself and Marea. We hope you are enjoying your custom joinery, from the KBE team!